Banair - Tachometers - Banair - Specialise in solving Test, Measurement and Design problems. These instruments have been especially designed to produce results rather than just readings. The SMART T50 range have 10 functions, each of which is easily programmed to produce results in the units in which they are going to be used. When suppied these 10 functions are pre-programmed with parameters useful in a wide range of applications. The instruments also have 10 memories which are avaliable to store values for later use or manipulation by the functions. A pair of memory values can be divided to calculate gear ratios automatically. The unit is made more versatile by inclusion of a counter and stop watch, both of which can be stopped and started using a switch or opto reflective tape. User programmable units - displays results. Smart bi-colour target indicator - solves false reading / alignment problems. 10 backed-up memories - switch off and results are saved for later use. Counter function - count units off production line. Dual control - all above functions initiated by switch or optical transceiver. Very low speed ranges down to 0.1999 rpm (300 seconds per revolution). Automatic range selection (0.1999 to 100,000 rpm). Distance up to 1 metre. Updates every resolution at low speeds - variations easily seen. Unaffected by extraneouse light - works in all lighting conditions. Non-contacting - safe for use on machines with limited access or guards. Linear and cyclic speed measurement. Simply interfaces to other electrical systems. Single MN1500 battery, rechargeable or mains versions avaliable. Hand held Smart Optical Tachometer 0.199 - 100,000 rpm. Multi-function unit / Counter / Timer. Remote Optical Sensor - Interfaces to all T50 Tachometers Units. Remote Linear contacting sensor Interfaces to all T50 Tachometer Units. Interface unit - Provides TTL O/P suitable for all Tachometers from customers own pair of contacts - either n.open or n.closed - or wide range of OEM sensors e.g opto/hall/reed/mechanical etc. Mains powered (240-110V) Tachometer unit with LCD display - Ext signal required (e.g from T50-02, T50-03 or T50-04). 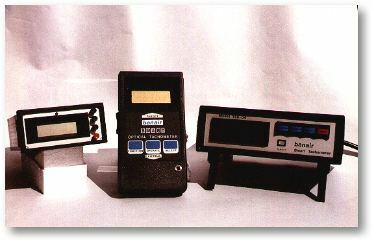 Mains powered (240-110V) Tachometer similar to T55-01 with RS232 output. Mains powered (240-110V) Tachometer unit - with analogue O/P (4-20mA, 0-1V, 0-10V).